File photo dated 27 May 2004: Newly-graduated gardaí waiting to receive their diplomas at Templemore, Co Tipperary. 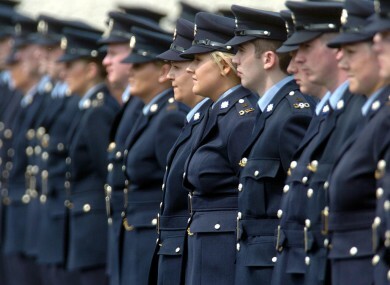 MINISTER FOR JUSTICE Frances Fitzgerald has announced the first intake of new garda recruits in five years. Over 20,000 applications were submitted to the Public Appointments Service, which oversaw this first garda recruitment since May 2009. One hundred new recruits are to enter the Garda College in Templemore, Co Tipperary and start their training in early September. Following the successful completion of the two-year training programme, the new gardaí will be awarded a BA in Applied Policing. Announcing the recommencement of garda training, Fitzgerald said that she understands the Public Appointments Service will soon be in touch with the successful applications to advise them of the offer to attend Templemore. The Justice Minister also said that the recruits will undergo a new training programme developed to reflect the current policing environment and to better prepare the recruits for the realities of their job. Email “Over 20,000 applications for first garda recruitment in five years”. Feedback on “Over 20,000 applications for first garda recruitment in five years”.